Regular readers know Matty G was once a regular contributor. Circumstances have drawn him away from Red’s Army, but KG coaxed him out of semi-retirement with that finger-waving thing he did to Jose Calderon. Please enjoy the return, however temporary, of Matty G. Video of the KG/Calderon moment and daily links after the jump. For anyone who wasn’t sure what Kevin Garnett brought to the table, they got a full understanding of it last season. Monster dunks, a beautiful 18 foot jumper, and tons of profanities, just to name a few. But his best attribute is his defense. Not only did he take home the Defensive Player of the Year award, but the Celtics as a team allowed just over 90 points a game. Defense wins championships, as the Celtics learned last season. But Garnett’s defense spans far more than blocked shots and steals, and it showed in last nights 94-87 win over the Toronto Raptors. Like I need another reason to despise this insecure crybaby. He cheats at Halo! If Gilbert wasn’t an insanely talented basketball player… he’d be one of those paste eaters on Jackass who do dumb things to themselves for attention. Dumbasses. There’s still plenty of time to submit a Gilbert Arenas heckling TShirt idea. Once again Boston has three sports worth watching with the Celtics joining the Patriots and Red Sox. The chunk of time from the end of the Super Bowl until the start of spring training won’t be a complete waste anymore. Kevin Garnett and his 6’11 frame have put the Celtics back on the map. 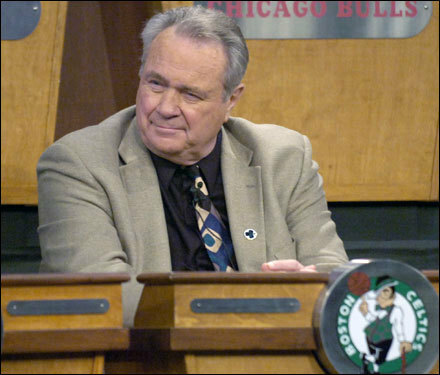 Who knew that Tommy Heinsohn witnessed the best thing that could have happened to the Celtics on draft lottery night? Who knew that when that Celtics logo was pulled from that envelope 4 envelopes earlier than we thought… it would set into motion a chain of events that made us contenders years earlier than we expected. Yes, I let out an f-bomb when I saw that card. But I didn’t know that it was exactly what should have happened. That card coming out at #5 is what pushed the snowball off the side of the mountain… and triggered the avalanche that brought #5 (currently the best selling jersey on the NBA.com store) to the Celtics. Not only did getting the 5th pick punish everyone who thought tanking was a good idea (including the Celtics brass)… it forced Danny Ainge to make something happen. With tradeable chips on the roster and a draft pick that many teams coveted, Danny had no choice but to abandon the “build around Al Jefferson” plan. Enter Ray Allen and Kevin Garnett. Yes, we still have to figure out some complimentary pieces, but the Celtics now have one of the best starting 5’s in the NBA. And it’s all thanks to #5… as in the player… and the draft pick. Matty G agrees that there is reason to be happy again in Boston. Shira Springer takes us behind the scenes on KG trade day. Mark Murphy looks at how foolishly some money is being spent around the NBA. Peter May has a look at how the East has improved. Scott Souza tells us how Paul Pierce is happy about the team’s direction. 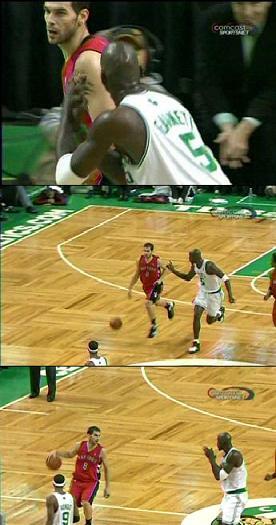 When Kevin Garnett does in fact come to Boston, it’s not going be the worst thing in the world. It takes two and a half stars to win in the NBA, so mixing Garnett with Paul Pierce and Ray Allen is just crazy enough to work. But there is still the bitter taste from sending away Al Jefferson that leaves me feeling disappointed and worried. The depression that I will have over losing Ryan Gomes would be far too deep to talk about. I don’t hate the deal, but at the same time, I don’t love it. So I guess I will feel somewhat happy when the season starts in November. Which is a huge improvement from the way a lot felt last season. Matty G is a happy guy. He’s always walking around the Red’s Army corporate office with a big smile on his face, asking people how they’re doing, and telling people things are going to be ok. The only thing that can follow an eventful draft night like last night is a draft hangover. The morning that you grab your head, and really try to put together everything that happened the night before. With Steven A. Smith’s shouting still ringing in your ears, it’s hard to comprehend that not only was Joakim Noah wearing a ridiculously crazy bowtie, Isaiah Thomas traded for someone that will most likely get killed in New York, and Danny Ainge actually pulled off a pretty decent trade for an All-Star. As a bonus, Danny did it without giving up Al Jefferson, Gerald Green, and even that $11 Million contract that expires at the end of the season, better known as Theo Ratliff. Paul Pierce will finally have a name for that veteran help he has been asking for, and that name is Ray Allen. Matty G helps us wrap up this wild ride that was the Kevin Garnett rumor. May it rest in peace. Thanks for stomping on our hearts KG. Kevin Garnett just spat on the Celtics and called off a deal that would have had him wearing green next season. In all, it wasn’t a great deal. Al Jefferson and the fifth pick in next weeks draft (it’s sneaking up on us) would be added to the departed list, and Troy Hudson would be coming along with Garnett’s $22 million paycheck. As a bonus, Wally World would relocate back to Minnesota and bring Sebastian Telfair with him. The downside is The Big Ticket has an option to end his deal after this season. If he isn’t impressed with what the Celtics do, he is gone. With Hudson and his scary hair around until 2010, it is a high risk deal. So maybe it’s a good thing Garnett called it off. Don’t get me wrong, Garnett would have been great with the Celtics. Paul Pierce would have a teammate that was actually better than him. Garnett is an unbelievable force, and would have dominated the Eastern Conference. The Celtics sell plenty of tickets, but Garnett is a reason to get excited to go to a game on a week night. Winters haven’t been to exciting in Boston the passed few years. Garnett would change that. Pierce would be just what he needs, and Garnett would be what Pierce needs. It’s almost a match made in heaven. But Garnett would opt out after next season if things didn’t work, and the Celts would be left with nothing. Garnett would be gone, Danny would be gone, Doc would be gone. It would be starting all over again. With Paul Pierce, of course. So would it be worth passing along Al Jefferson? The kid we’ve sat with for three years while he blossomed. He may never be as good as Garnett, but Al is Al. Last year was no fluke. In my opinion, he is the only untouchable guy on the team (possibly Rajon Rondo as well. That’s not saying Pierce should be traded, but Danny should listen to offers). But Al has survived nearly every trade rumor, from Jermaine O’Neal to Allen Iverson. Maybe this is a sign that they should keep this guy. Al is also younger than anyone I know at 22, and Garnett nine years his elder at 31. It might not be a bad idea to stick with three more years of Al, when he should hit his peak. So from Red and DJ, to the Lottery, and now this. It hasn’t been a year for the Celtics to be proud of. The Celtics are hitting low points all around. But maybe this is a blessing in disguise. A mulligan for what would have been a make or break move. And with the Greens luck lately, would a risk be worth taking?